One at a time, attach the two suction cups to the bridge assembly with the two Phillips head screws as shown in the Figure. 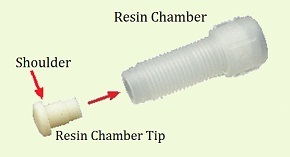 While holding the resin chamber in one hand, insert the resin chamber tip as shown in the Figure. Push the tip in until it is fully seated against the shoulder of the resin chamber. 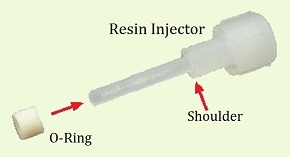 While holding the injector in one hand, slide the injector o-ring onto the injector as shown in the Figure. Push the o-ring onto the injector until it seats against the shoulder at the mid-point.